Great website and marketing copywriting is a lot like a song lyric. It must be tight and concise. Every word carries 1,000 pounds on its shoulders. A great song lyric sits well over different treatments musically. So should your copy. Simon and Garfunkel’s The Sound Of Silence works well in original form and in a much darker rendition by the band Disturbed. Or think of the songs Postmodern Jukebox covers. Here is a rendition of the song Nothing Else Matters, written and originally performed by Metallica. The lyrics stand strong in this complete retreatment. It’s for this reason, we first write and send all your copy to you in a simple word document. Why? Your web copy needs to stand on its own, like a great song lyric, in simple black and white. Content drives design, not vice versa. What is the message we are sharing? It always centers around benefits to the end-user/reader. We’ve seen our website writing stand the test of time. 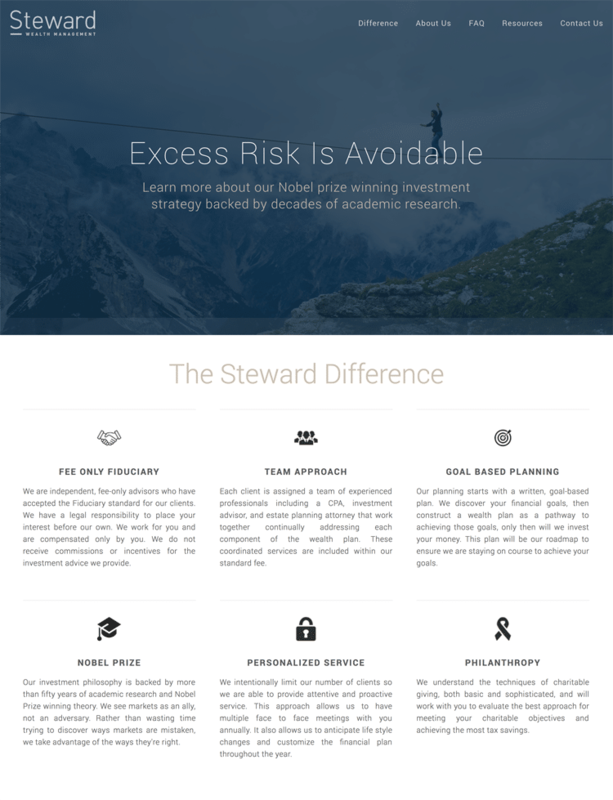 We wrote the copy for Stewardship Wealth Management, and the site has seen a completely new design regarding its look. All the website copy was brought over. Why? Because we had nailed it when first written. If you are constantly having to edit your website’s content on the main pages you haven’t boiled it down to the chief benefits to the end-user/reader yet. Constant rewriting means your content is at the trendy level, not the core value level. That doesn’t change rapidly. We know your brochure or website content isn’t a novel, but it should stand the test of time like one. Key to your marketing copy’s longevity is capturing your chief value proposition. Is the problem Unworkable? Does your solution fix a broken business process where there are real, measurable consequences to inaction? Will someone get fired if the issue is not addressed? *If the answer is yes – then that person will likely be your internal champion. Is fixing the problem Unavoidable? Is it driven by a mandate with implications associated with governance or regulatory control? For example, is it driven by a fundamental requirement for accounting or compliance? *If the answer is yes – then that group will likely be a champion. Is the problem Urgent? Is it one of the top few priorities for a company? In selling to enterprises, you’ll find it hard to command the attention and resources to get a deal done if you fall below this line. *If the answer is yes – then you know you’ll have the attention of the c-suite. Is the problem Underserved? Is there a conspicuous absence of valid solutions to the problem you’re looking to solve? Focus on the whitespace in a market or segment. *If the answer is yes – then you know the market is primed for the solution. Qualify the Problem: Is it “Blac and White”? Is it BLAC (Blatant, Latent, Aspirational, Critical) and does it address a WHITE space in the market, allowing you to capitalize on an open area of opportunity? Whether you need a new website, a website redesign or simply a copywriter for your site or marketing materials, we are here to help. Contact us for your free consultation at 817-889-1487.